The benefits of phasing out coal exceed the costs and open up new economic opportunities. The technologies necessary for phasing out coal-fired power generation are already available or have been developed to such an extent that they can be implemented within the required timeframe. A coal phase-out in Germany would stimulate necessary investments in demand management, storage, power-to-x applications, and efficiency technologies. Furthermore, a reduction in coal-fired power generation could in some places mitigate grid congestion. Currently, around 18,500 people are directly employed in lignite power plants and opencast mines; a further 4,000 to 8,000 people are employed in hard coal power plants. A large part of the decline in employment in the coal sector could be offset by regular retirement. A gradual closure of the power plants in a fixed order would enable a high degree of controllability and give the affected regions the lead time to shape structural change. The costs of wind and solar power are currently about the same as, or even lower than, the costs of electricity from new fossil fuel power plants. Moreover, missing storage is not an obstacle to the coal phase-out. Modeling shows that up to a share of 80 percent of renewable energies in the electricity mix can be integrated with flexibility options such as sector coupling, power-guided combined heat and power generation, heat storage and demand-side management. These options are also cheaper than seasonal electricity storage systems. German coal-fired power plants are already subject to the European emissions trade system. The scheme makes CO2-intensive electricity more expensive. However, despite the significant increase in certificate prices in 2018, the system does not provide sufficient incentives for a secure and continuous reduction, especially of lignite-fired power generation. The authors of the Coal Reader, therefore, examined potential additional measures. The analysis shows that planning security for all affected by the transformation process is highest if coal-fired power plants are shut down in a fixed order. It is more difficult to estimate the concrete effects of price-based instruments such as a minimum CO2 price. Chapter 1 examines the relevant economic aspects of reducing and prospectively phasing out coal-fired power generation. Starting with the description of the coal-fired power plant park, this includes an overview of cost structures and price formation up to the implications of coal-fired power generation for the profitability of gas-fired power plants or risks for future grid bottlenecks. Chapter 2 presents the climate policy framework for the use of coal as an energy source. 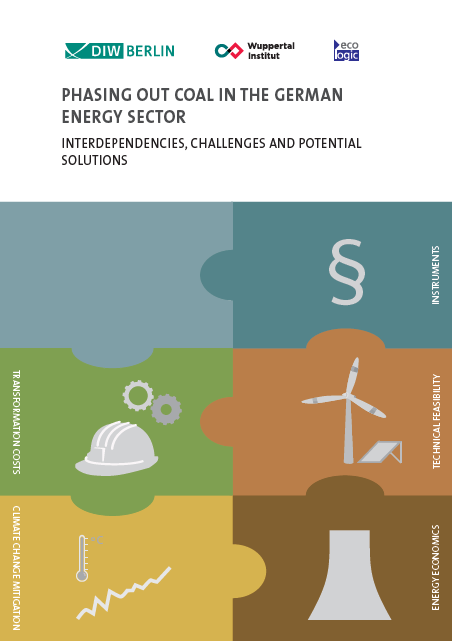 The consequences of climate change are outlined, the Paris climate targets and international trends in coal use are presented, and key points for reducing coal-fired power generation in Germany are identified. Chapter 3 gives an overview of the technical aspects of an energy supply without coal. Requirements such as more flexibility and energy efficiency, the design of the expansion of renewable energies and electricity grids, natural gas as a bridging technology and the role of storage facilities are addressed. In addition, it provides scope and solution options for maintaining the security of supply for electricity and heat. Chapter 4 looks at the transformation costs of a coal phase-out. Starting with an overview of the regional economy in the lignite mining regions, employment effects and opportunities for successful structural change are outlined. In addition, the effects of the transformation on the stock exchange price of electricity and the costs of the renaturation of opencast mines are discussed. Chapter 5, prepared by Ecologic Institute, compares the advantages and disadvantages of potential policy tools to reduce coal-firing. Criteria include the instrument’s reliability to achieve a certain emission reduction target, planning security, legal certainty and economic effects. The Annex contains a list of all German coal-fired plants, including technical characteristics of each plant. German Institute for Economic Research, Wuppertal Institute, Ecologic Institute (eds.) 2019: Phasing out Coal in the German Energy Sector. Interdependencies, Challenges and Potential Solutions. 3.4 Significance of storage technologies.